Not only did your birthday fan mail make me laugh so so much (my heartfelt thanks, everyone! 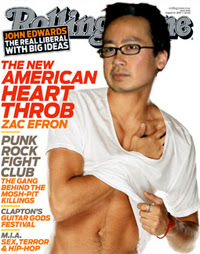 ), but Zac Efron is now so so jealous of me that he has taken drastic measures to be more like me. He's bought glasses just like mine, dyed his hair black and styled it just like mine, and has been squinting his eyes more to make them look Asian just like mine. Thanks to the amazing Geoff (who, along with Amy, rule Massachusetts) for submitting this startling new pic of Zefron, which shows you how he has been obsessing about me to the point of becoming me. I only have this to say to you, Zefron: "You don't know me, you don't know me!"